Mustafa Sav is originally from Istanbul, Turkey, where he was born. He has attended schools in Turkey, Switzerland, Germany, and Austria. He was a student in the five year culinary program at the Klessheim International Hotel and Restaurant Management School in Salzburg. From 1975-76 he was employed for the grand openings of both the Sheraton and Intercontinental Hotels of Istanbul. This led to his position as the Food and Beverage Manager of the Divan Hotel, also in Istanbul, Turkey. While he was employed at the Divan, a visiting Personnel Manager from the United States hired Mustafa to work for the Royal Caribbean Cruise Line. He arrived in Miami in July of 1980 and worked on the ship “Song of Norway”. Later that same year he began working at one of few Four Star Restaurants in New York City, the famous “Vienna 79″, owned and operated by legendary and renown Austrian chef Peter Grünauer. Working there made it possible for him to purchase an ice cream store named ” Le Glacier” located on 79th Street and Madison Avenue. Though his life in New York City was busy, a chance trip brought him to Walton for the first time in 1986. He immediately fell in love with the natural beauty of the surrounding area which reminded him of the years he spent as a young man in Bavaria. Within a year of his first visit to Walton Mustafa became the owner of the North Family Mansion, which he purchased in 1987. The house was built in 1885 by William B. Ogden for a niece of Arthur W. North, both pioneering families and the first settlers in the area. Walton’s beauty and natural surroundings inspired him to name his next business venture “The Country Café”. Mustafa hired Walton resident Fritz Schellhaas, a master carpenter, to build the store using local Walton lumber in its construction. The Cafe is one of the three stores owned and operated by Mustafa in the heart of New York City’s Financial District. “The Country Café” and “Le Glacier” are located on the first floor at 60 Wall Street/Deutsche Bank Building Public Plaza. “The Country Café” has a second store located at 40 Wall Street Trump Building. 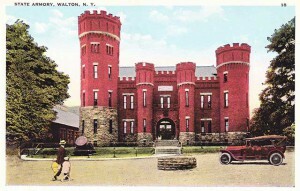 In 2006 Mustafa purchased the old Armory building in Walton New York. 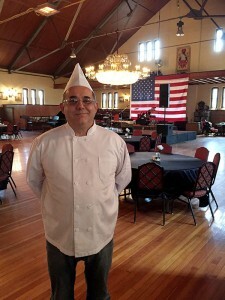 His desire was to combine his love for Walton and it’s history with his experience as a chef and a restaurateur, thus saving a historical building and creating an entertainment venue that would also benefit the local economy. The Armory was designed and built by Isaac Perry, the main architect for the New York State Capitol Building in Albany. Perry designed many other homes, buildings, and armories throughout the state which now are either privately owned or currently being used by the National Guard. 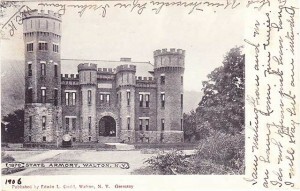 Walton’s Armory was built in 1896 to house the Thirty-Third Separate Company. The building has seen many changes and served many purposes over the years. ‘The Old Armory’ reopened its great doors as “The Castle On The Delaware” in November of 2013. The restoration of the building is an ongoing process and steps are taken to preserve this treasured historical building as closely as possible to its original state. The main floor has been beautifully restored and is available for dining or private parties. We hope you will consider “The Castle On The Delaware” as a destination where lasting memories will be made. Mustafa and his wife Alyona will be pleased to welcome you on your next visit to Walton. “The Castle”, as it is affectionately known to its patrons, is the perfect place for good times, great food and wonderful memories.